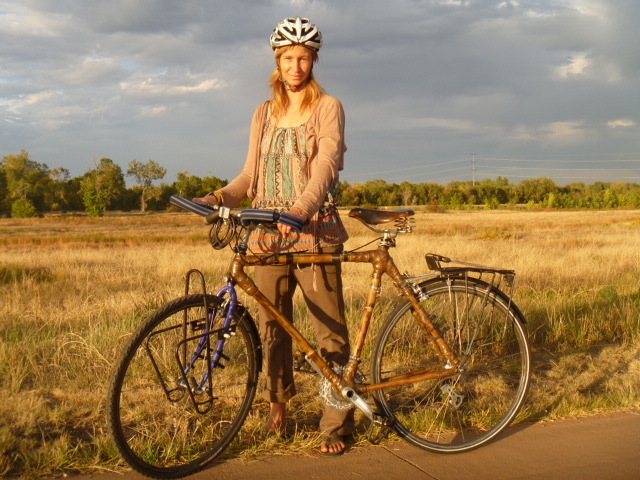 We built a bicycle out of bamboo for our journey in The Americas, to show off as a sustainable alternative while riding. We harvested the bamboo close to home in Australia, treated it, cut it and built a bicycle frame with the lugs and an old frame. 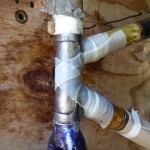 For a step-by-step explanation how we did it, please scroll down this page. 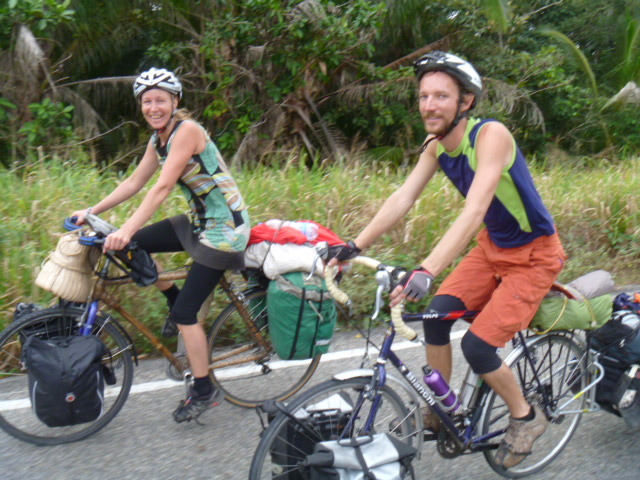 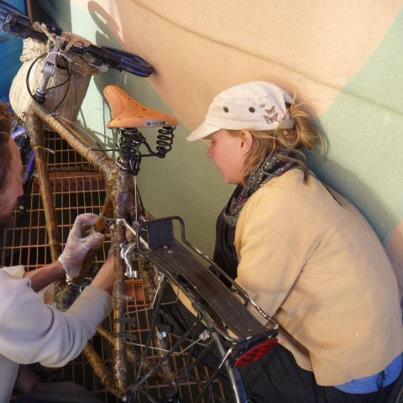 We cycled for more than 1.000 kilometres in the USA and Mexico, with the bamboo bicycle fully loaded. – at one time it even housed a small garden! Unfortunately the frame broke at the front joint in Mexico. 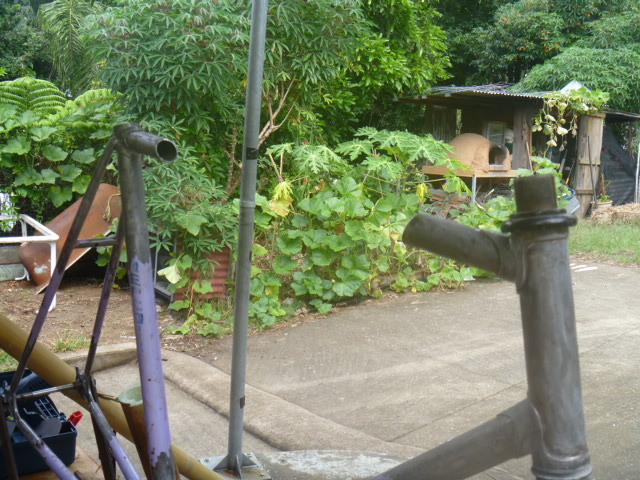 Presently it is living a happy second life as a bicycle blender at Casa de la Libertad in San Cristobal, Chiapas. 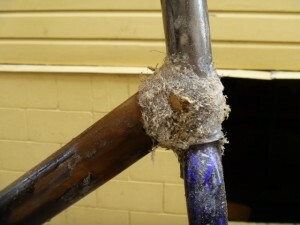 Scroll down to see images of the break. 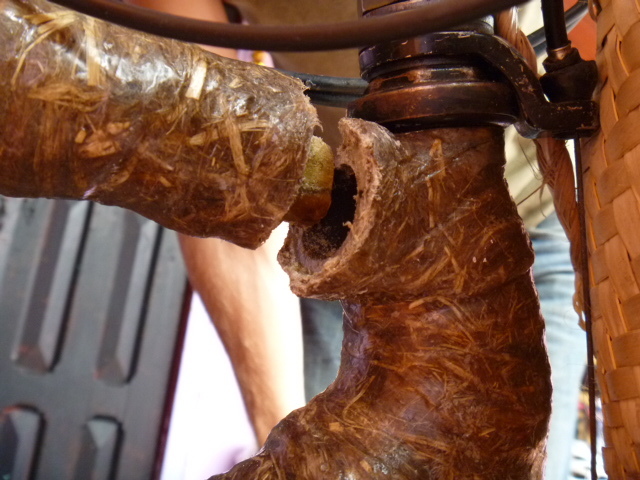 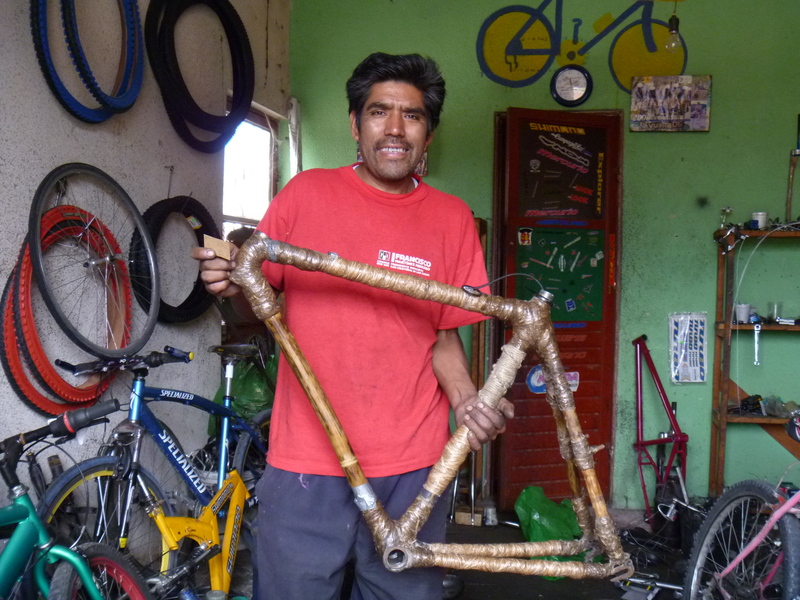 Unfortunately we had to leave the bamboo frame in San Cristobal, Mexico, as there was a crack in the hemp joint on the front. 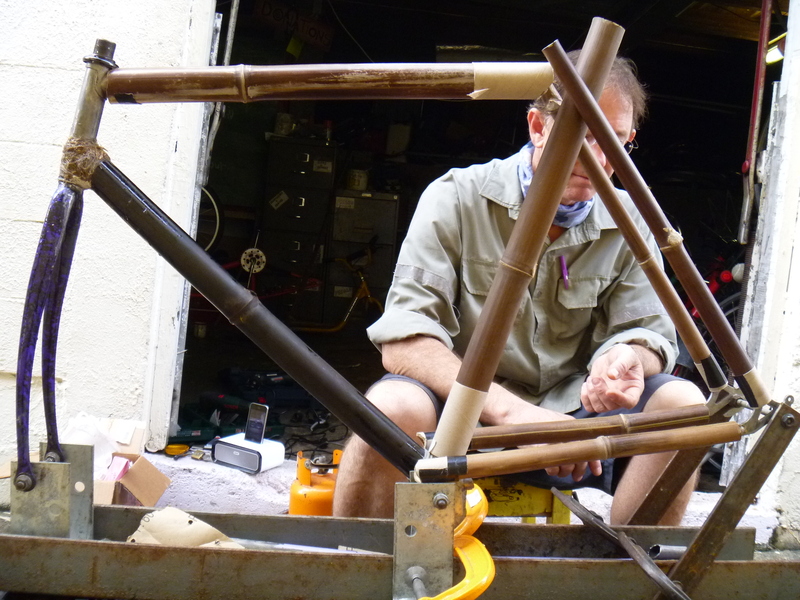 We have cycled more than 1.000 km with the first bamboo frame we built, so we are keen to built another when we have the chance!! 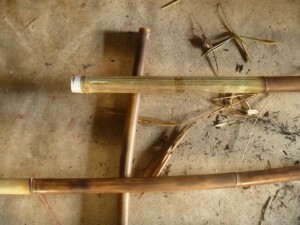 See some pictures below of the crack of the joint, and the crack in the bamboo that happened afterwards.. 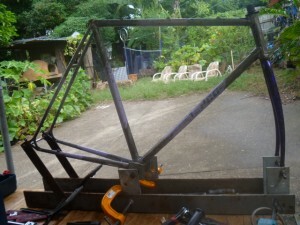 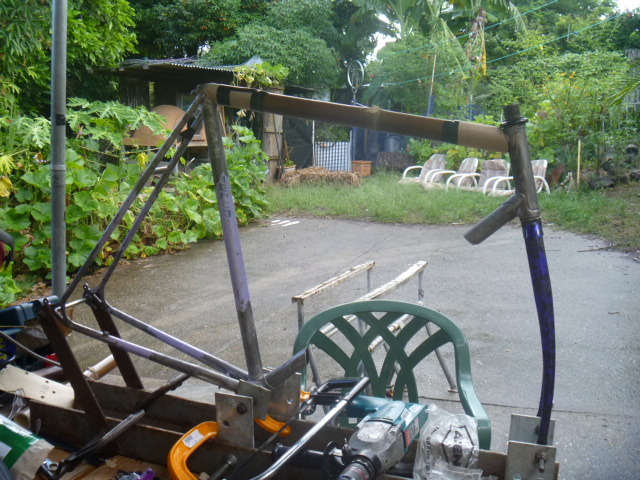 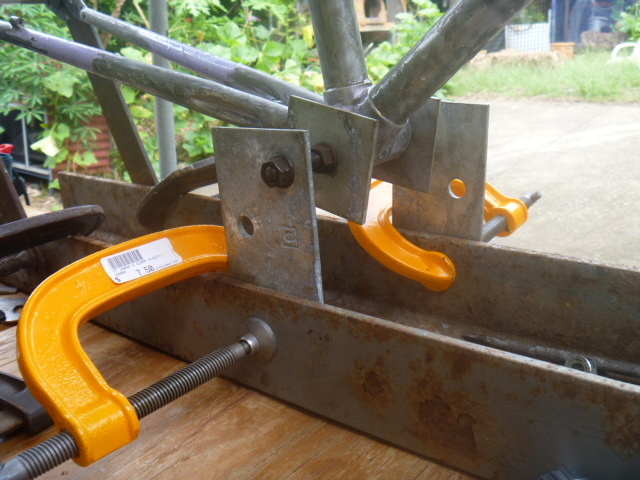 The patched and stripped frame as we left it in San Cristobal, ready to be turned into a bicycle blender! 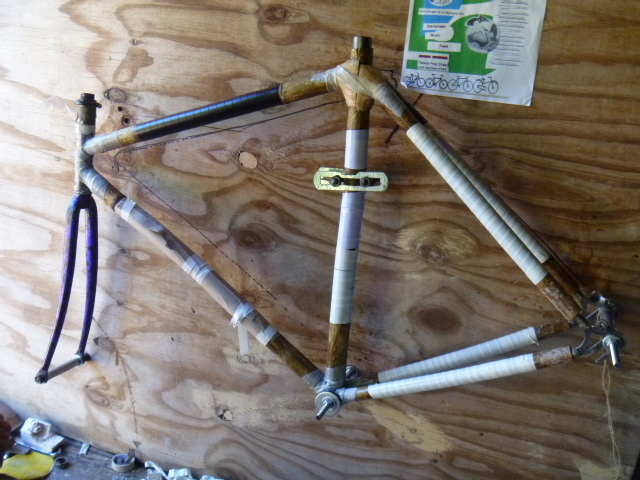 We have re enforced the bamboo frame with hemp fiber, so now it is a bamboo-hemp hybrid bicycle! 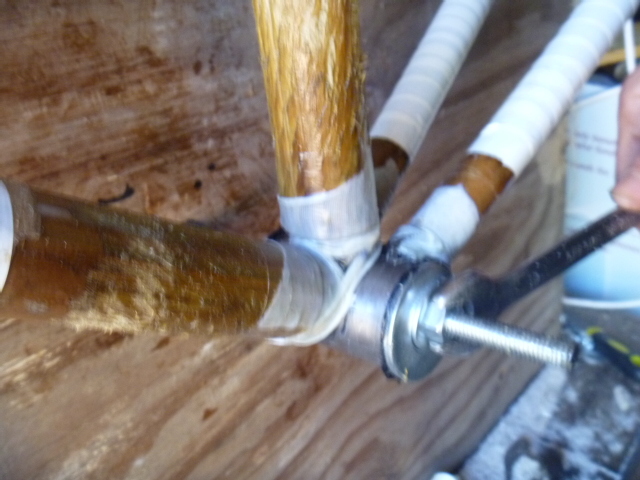 We made a horizontal jig of ply wood with threaded rod to hold the frame onto. 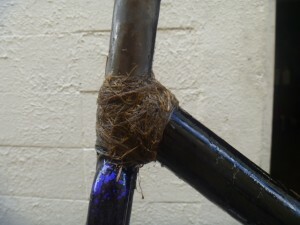 The so called ‘donor frame’ is made up of damaged frames donated to Turnstyle Community Hub. 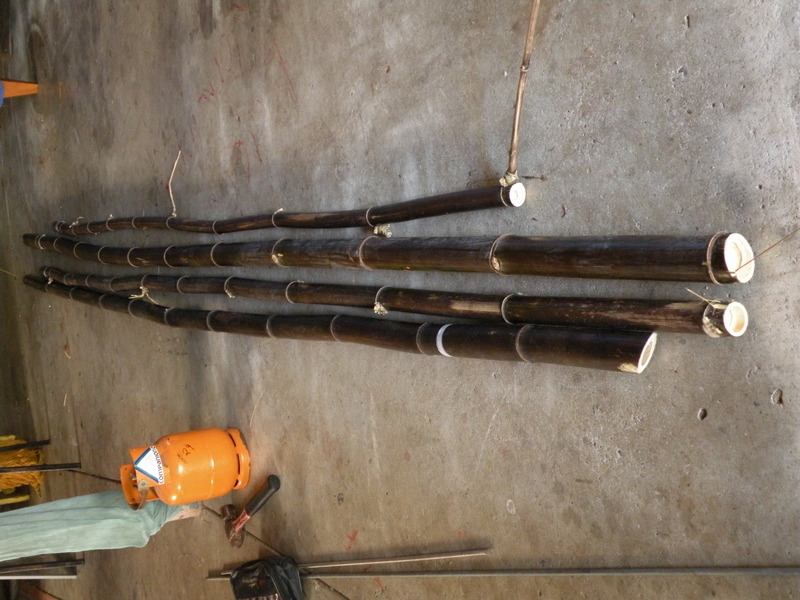 We cut the bamboo to size so it fits exactly into the donor frame. 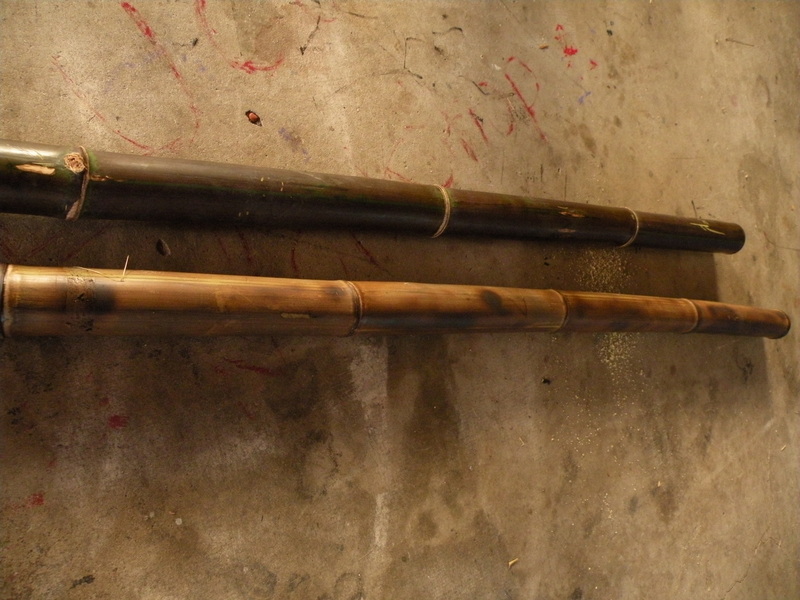 Inside the bamboo tubes (not shown on the pictures) we slid some thinner bamboo to re-ennforce the connection. 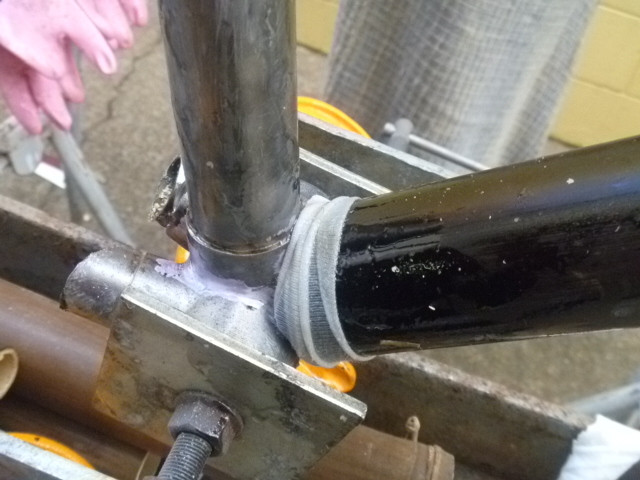 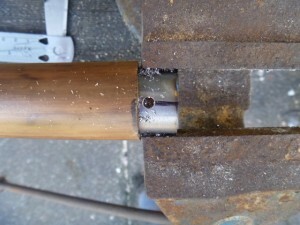 We dropped a metal seat post tube inside the bamboo seat post, which took a lot of filing of the bamboo and grinding of the metal to make it the right fit. 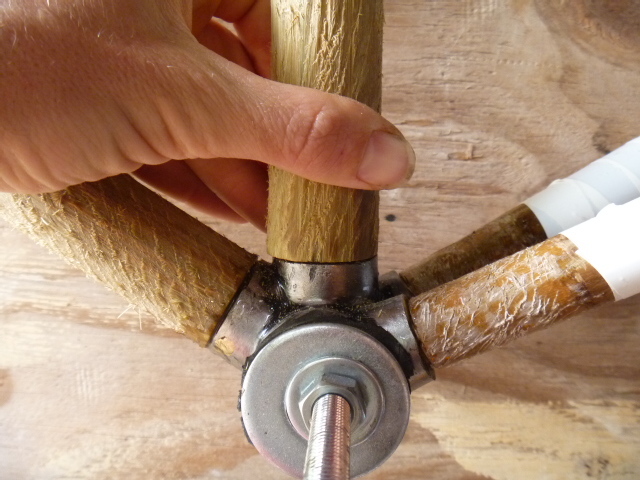 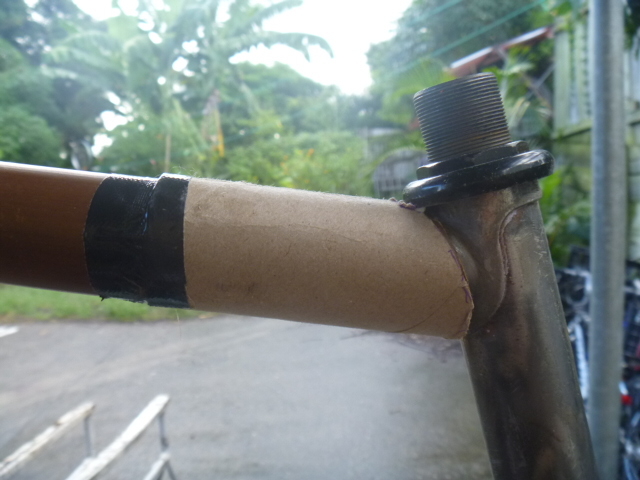 We made a seat post joint with balsa wood, with straight edges where the wood meet the bamboo tubes. 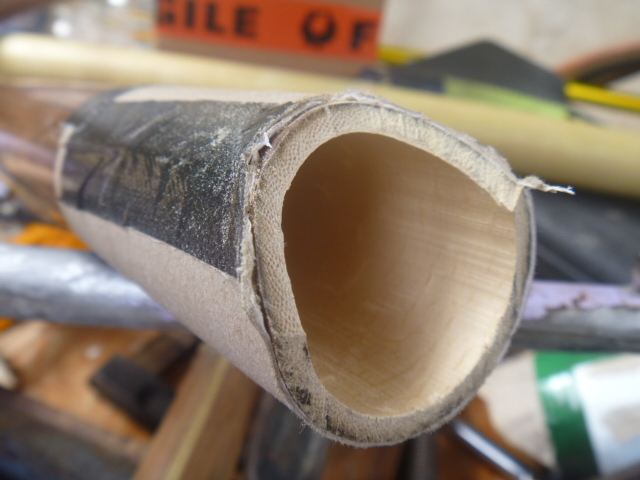 Balsa wood is a soft wood that can be shaped easily, allowing for extraordinary looking joints. 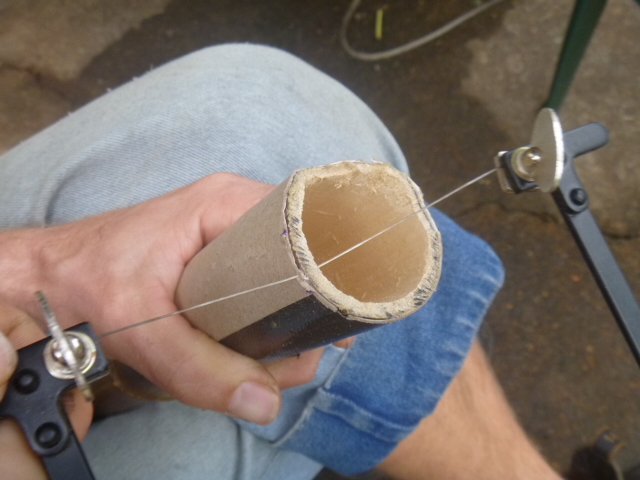 We glued the tubes on the balsa wood with epoxy, and shaped the balsa wood with a file and sanding paper. 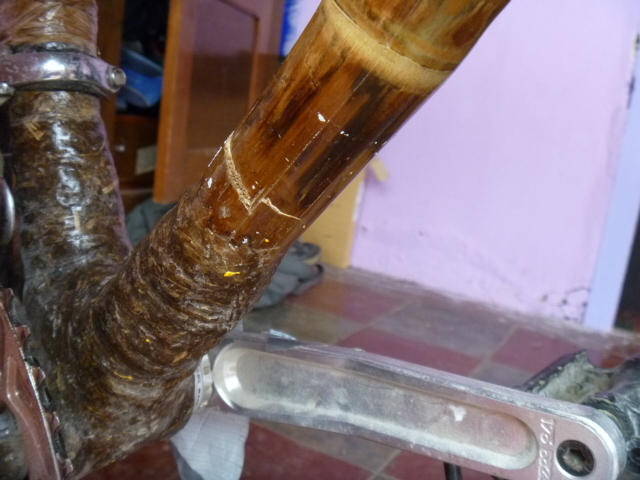 We reinforced the joints with bamboo cloth drenched with epoxy (an alternative to fibre glass which is used by other bambo o bicycle builders). 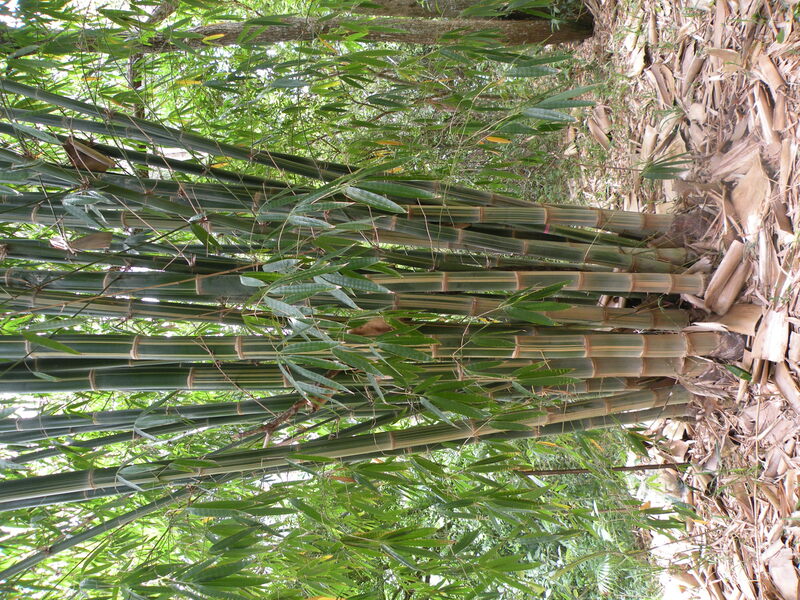 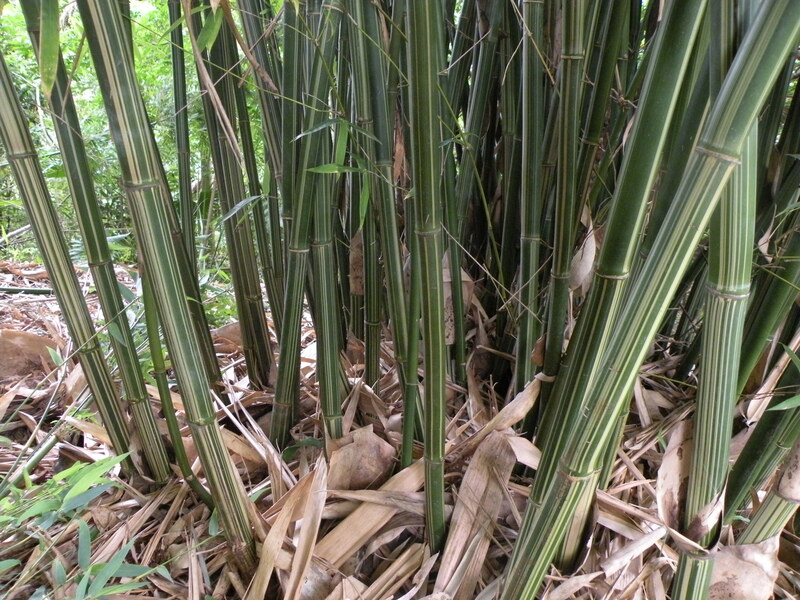 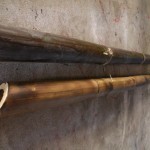 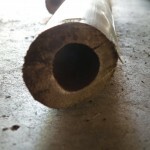 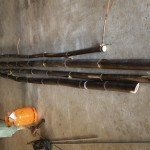 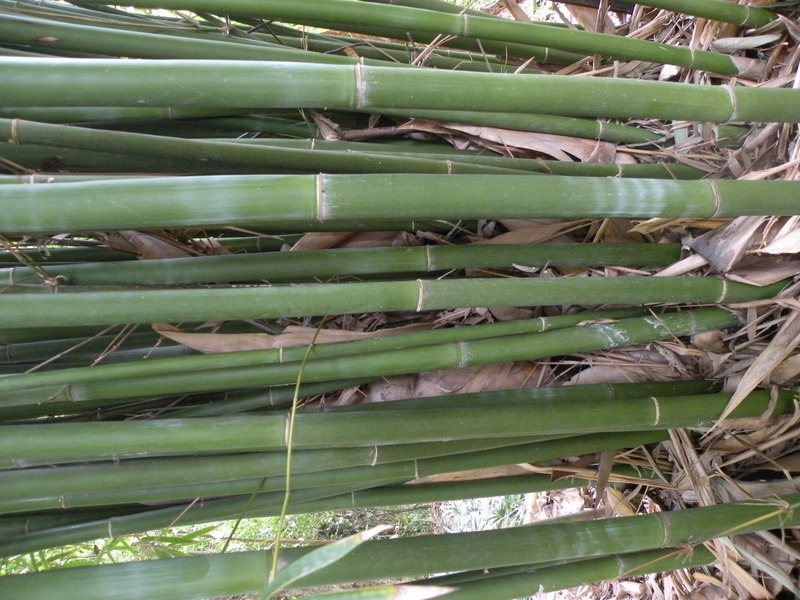 It is important to make strong connections between the bamboo and steel, crossing over the steel and bamboo. 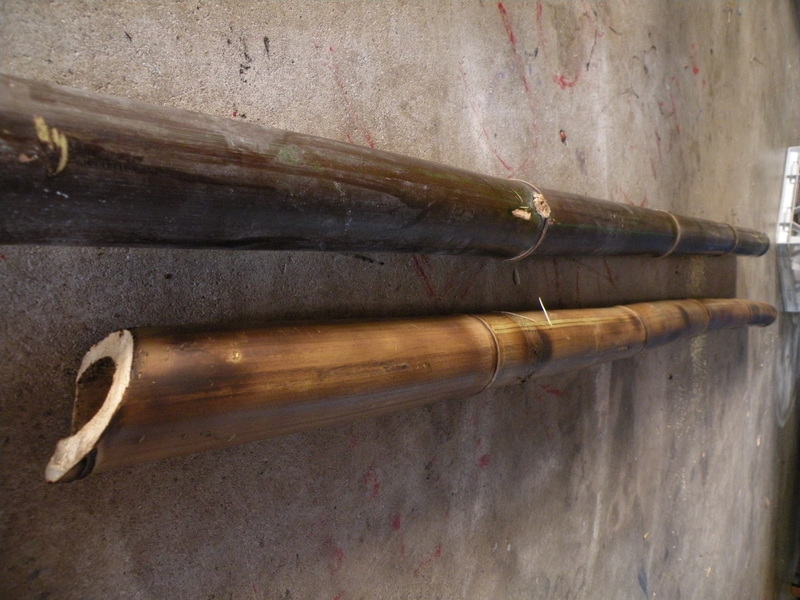 We taped bamboo tubes, to protect them from getting epoxy on them, and left it to dry and be a show case at our FUNdRaiser @Turnstyle on Sunday May 27th. 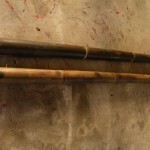 After the bamboo cloth drenched with epoxy resin dried properly, Nico sanded it down, creating a smooth surface for the next step: wrapping the joints with hemp fibre and epoxy resin. 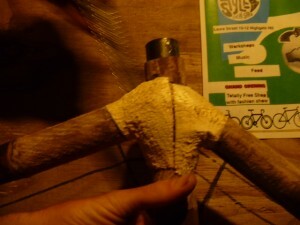 We started on the front joint. The surface of the joint needs to be wet with epoxy, before applying the hemp fibre. Wrapping the joints with long ‘dread lock’ strings of hemp fibre is a GREAT team building activity. You want to do it quite fast, before the epoxy hardens. 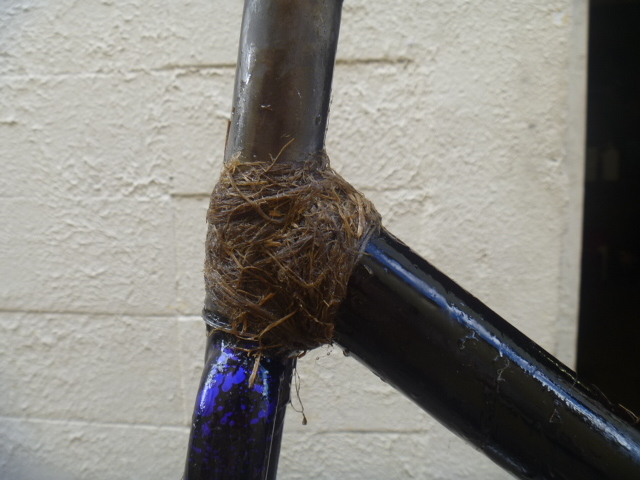 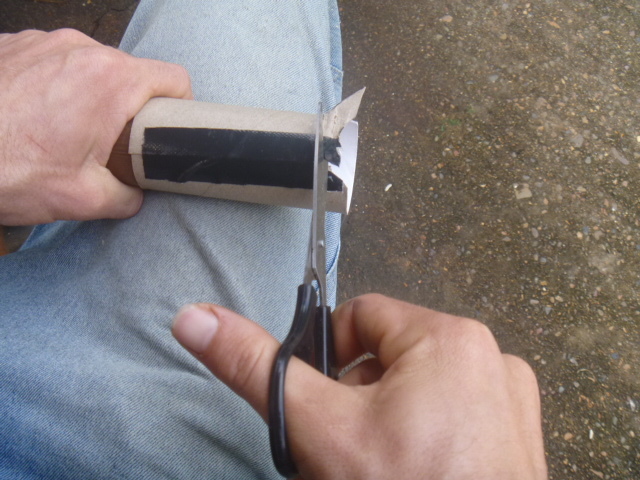 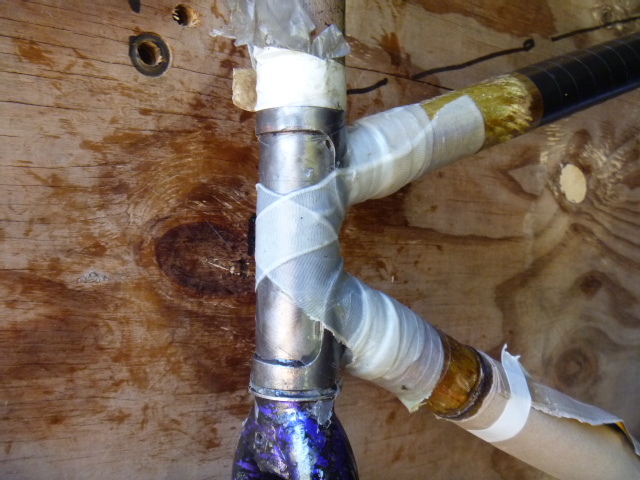 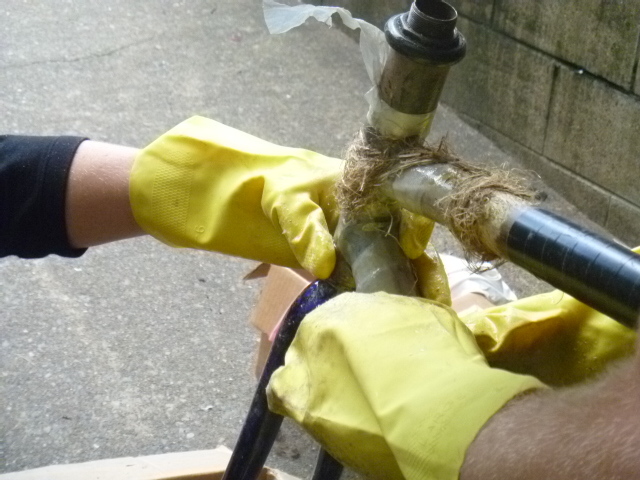 It is important to wrap the hemp fibre strings quite tightly around the joints, and then drench them in epoxy resin. 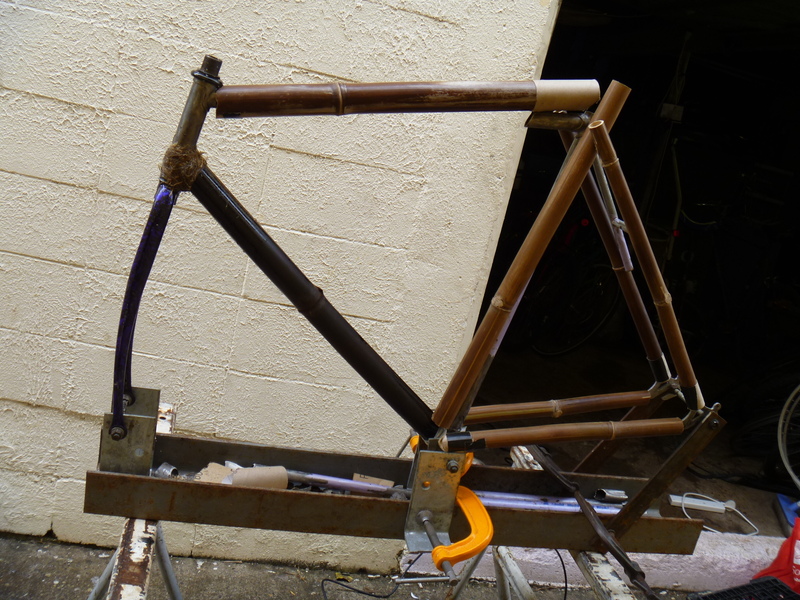 We have been working on a prototype for the bamboo bicycle frames we would like to ride. We dried out the bamboo with a blowtorch. 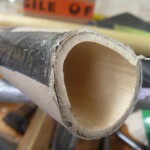 wrap, sand, wrap sand, ..
We used this frame to play with during the workshop we hosted on May 13th @Turnstyle in Brisbane and applied all we learned on the first frame for the journey. 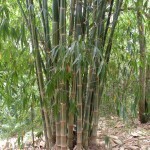 I have collected an assortment of bamboo for the bicycle thanks to Jasper Hall and the good paramedic Craig. 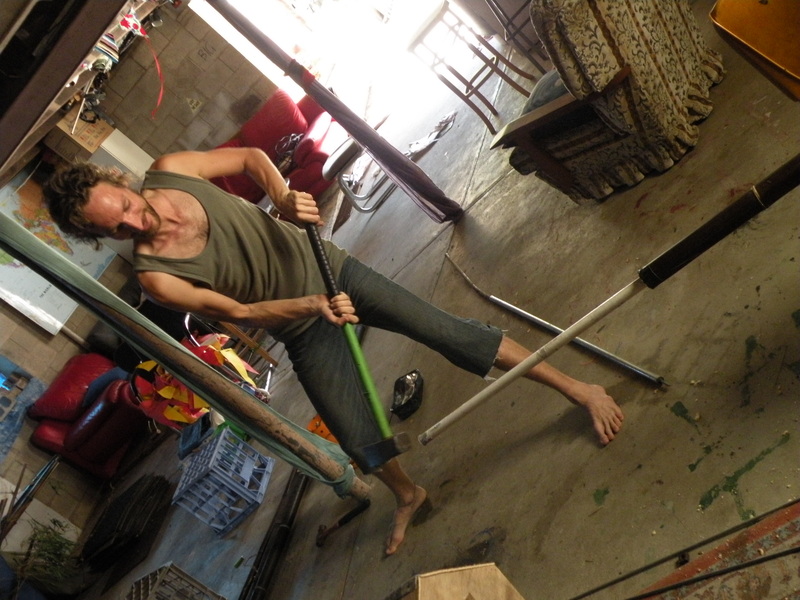 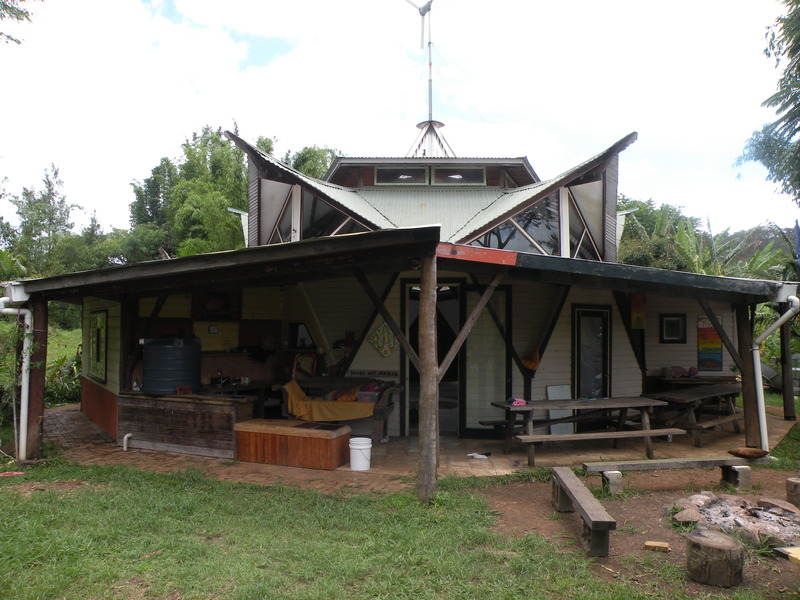 Jasper Hall is an inspiring permaculture paradise hidden in the beautiful hills of northern NSW. 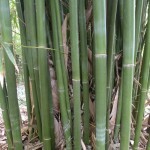 They are certified organic with appr. 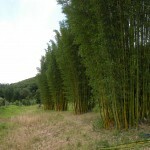 80 species of fruit trees, vegetables, herbs & salad gre ens. 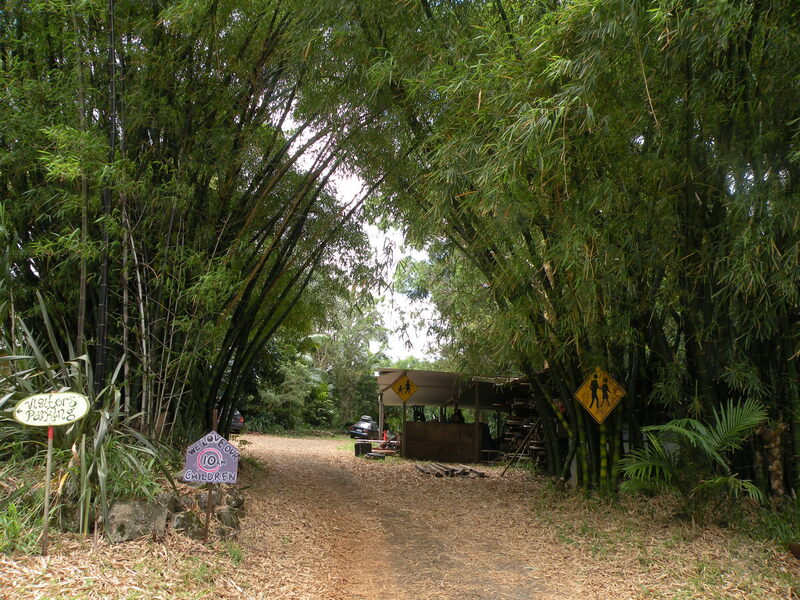 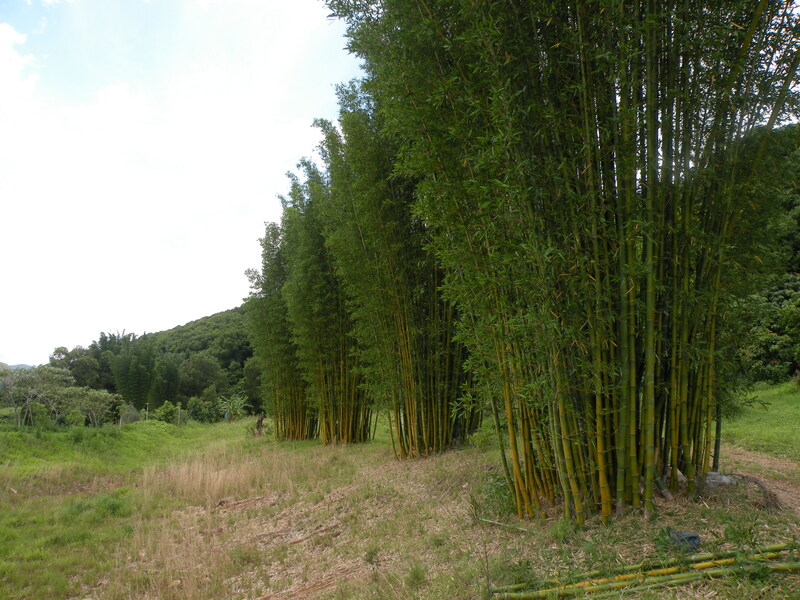 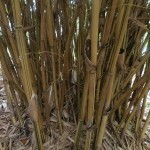 More importantly however they have 112 species of bamboo growing on the property, and a increasingly growing bamboo nursery. 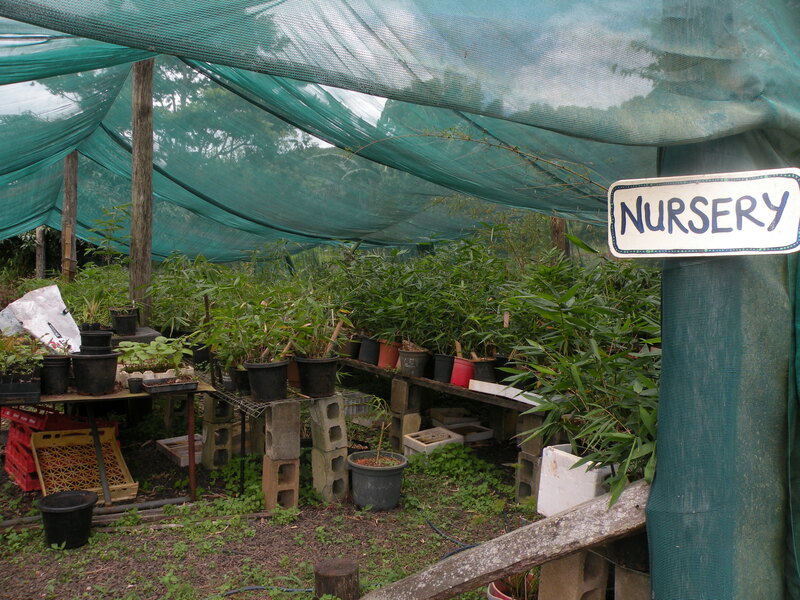 They were really nice people who gave me a wide assortment of species to experiment on, and a whole host of advice to guide me along the way. 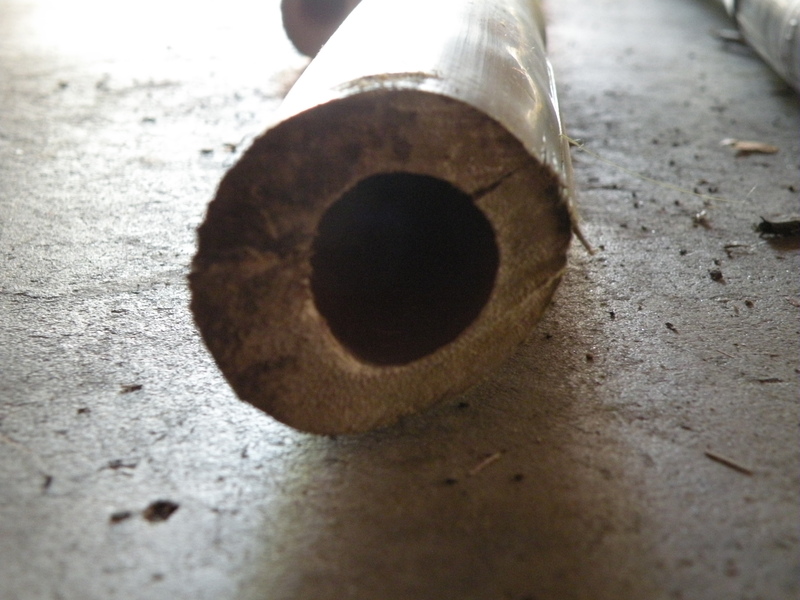 From Craig’s backyard we picked up some huge Timor Black, beautiful, but prone to splitting. 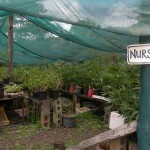 Just look at the size of those walls! 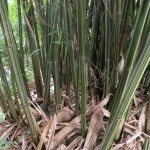 The black bamboo I would start drying out with a blowtorch so I would have somet hing to play with almost immediately. 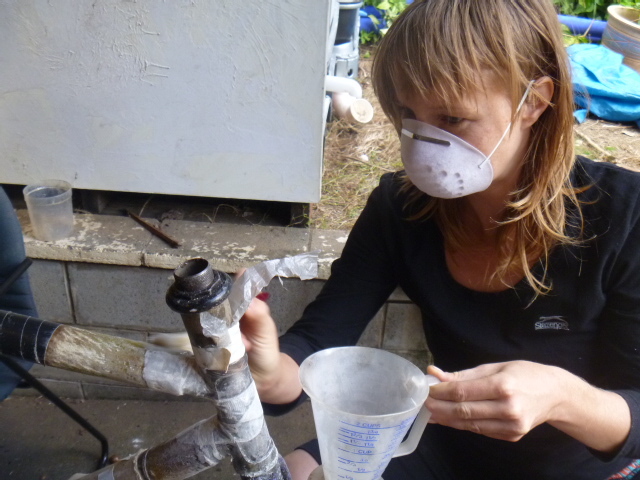 Whereas the rest I would treat with a mixture of Copper Sulphate and Boric Acid and let sit for two months. 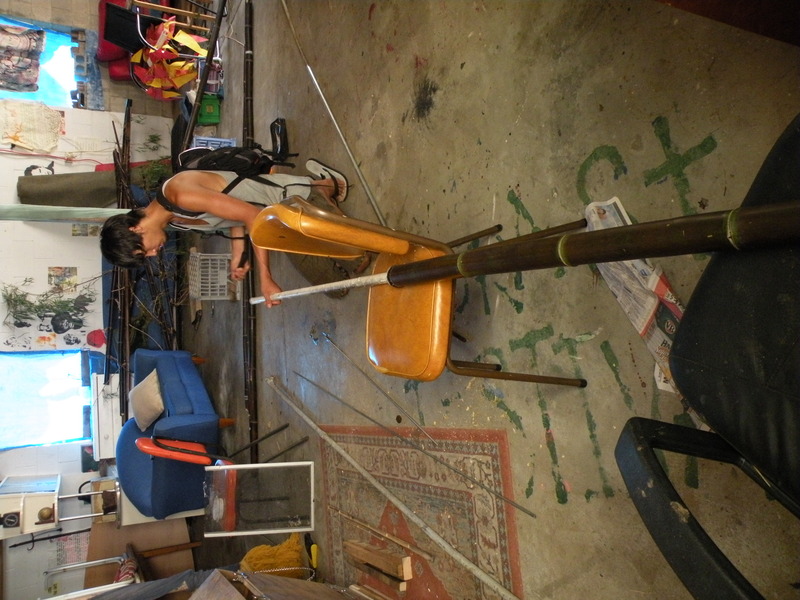 With the help and support of my friend Ko we started breaking down the nodes with a variety of instruments. 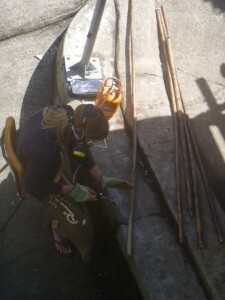 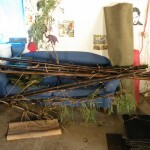 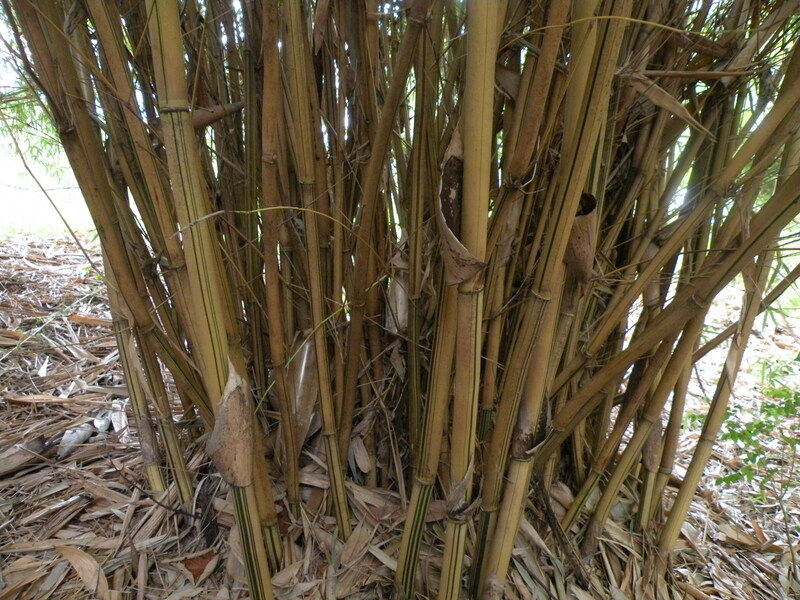 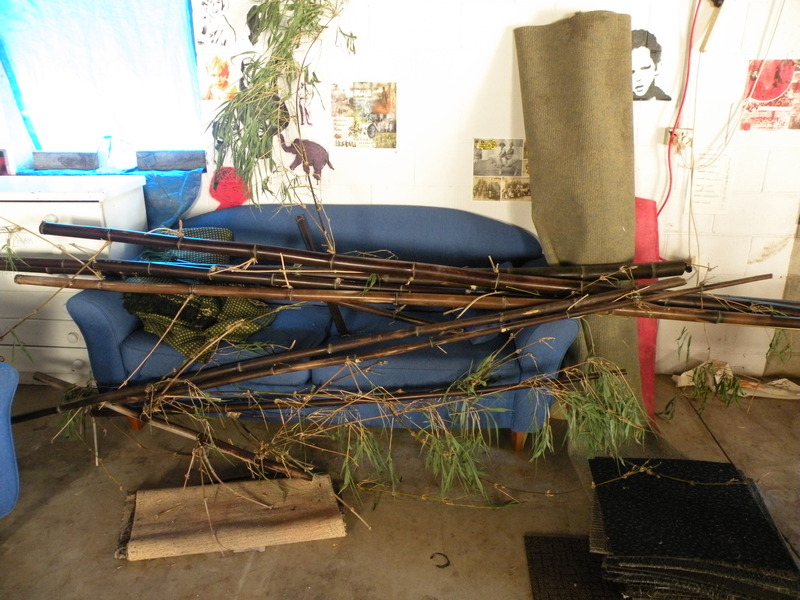 We broke all the nodes on the black bamboo and left the bottom node in the rest. 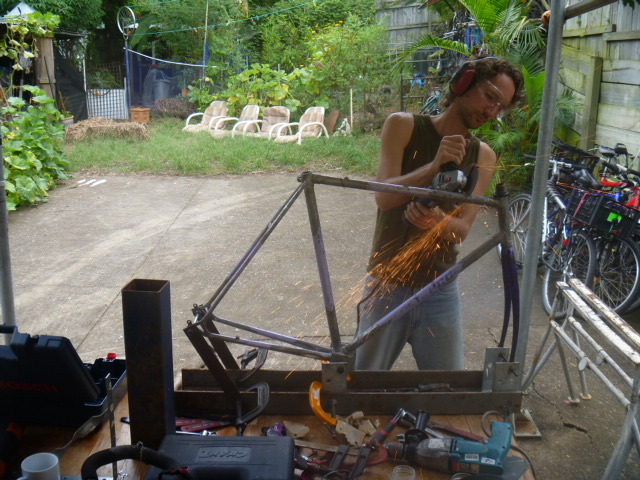 Mykal helps to run bicycle cooperative Strong Bearrings. 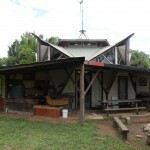 The cooperative is part of the Turnstyle Community Hub in Highgate Hill, Brisbane. Should you like to try and build a bamboo bicycle yourself the best and most informative site we have found so far is here. 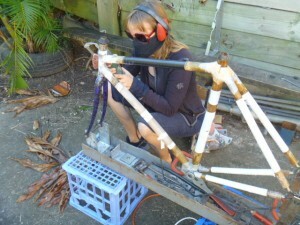 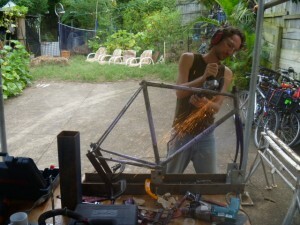 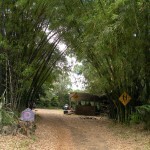 If you’d like to follow the progress of the Brisbane Bamboo Bicycle Collective, come join our group on Facebook. 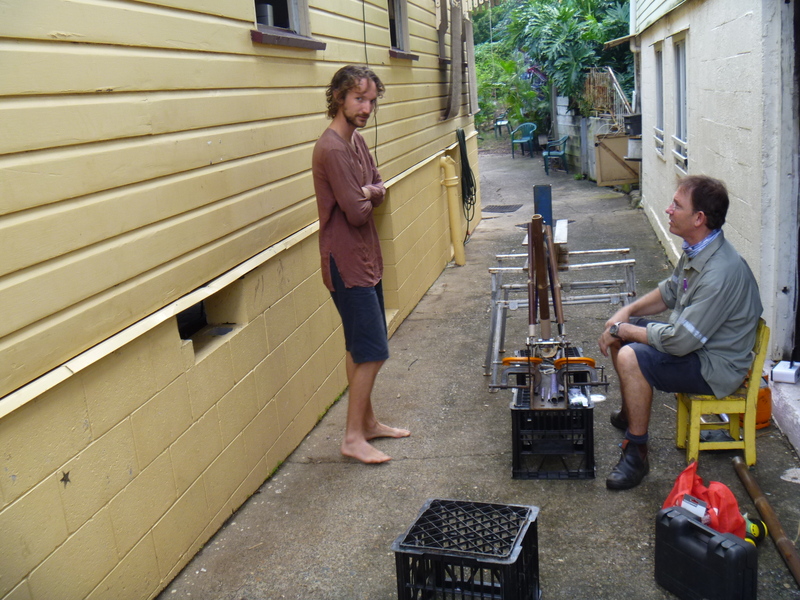 Hey how are you Michael, I’m Michael we meet yesterday in Brisbane CBD, so I just telling you as your blog is awesome, nothing to compare with ours! 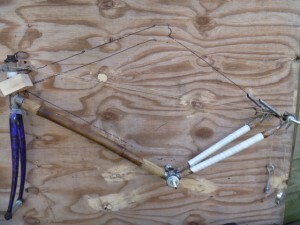 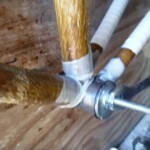 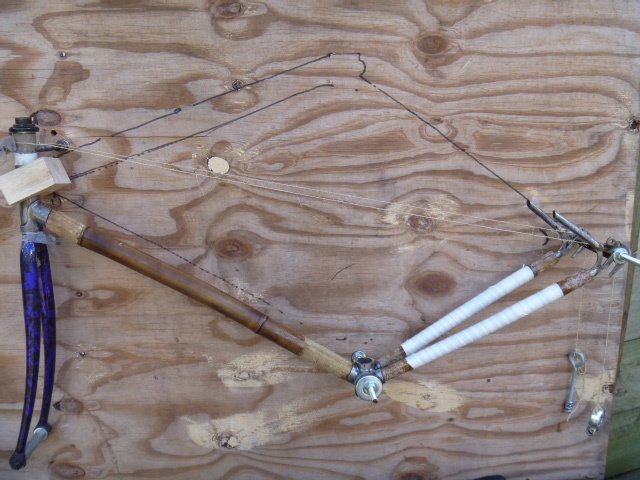 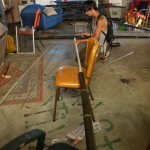 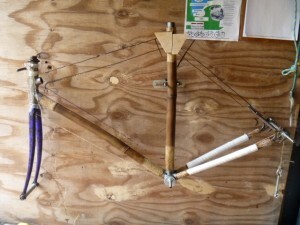 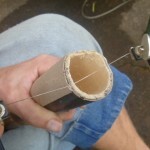 Awesome article and great use of recycled materials for making the jig. 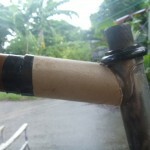 You have inspired me to make a new Eco bike jig.